I found this recipe on allrecipes.com and knew it would be perfect for Chicken Legs' birthday dinner. Chicken Legs loves mushrooms. I think they are vile and disgusting, but I am the "plain chicken" girl after all. 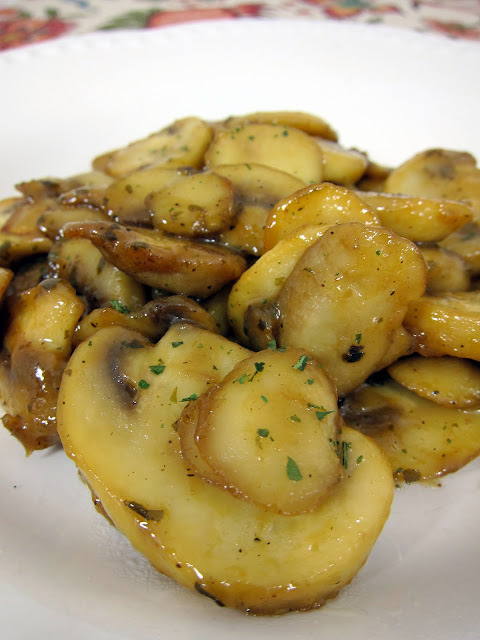 These mushrooms are incredibly simple. There are only three ingredients - butter, fresh mushrooms, and Ranch dressing mix. The original recipe called for a whole stick of butter. I cut that in half and it was plenty! Chicken Legs said the mushrooms were delicious. He gobbled them up along with his favorite grilled chicken - Alice Springs Chicken. In a large skillet, melt the butter over medium heat. Add mushrooms and Ranch dressing mix; stir to coat. Cook, stirring frequently, about 30 minutes - until the mushrooms are very tender. These just went to the must try list! Wish I had looked at FB before I left for the grocery store. Will be making this next week. We love mushrooms. I love mushrooms and this looks like a keeper. I will gobble this down with Chicken Legs and you and my Plain Chicken husband can eat together!! I just made these tonight and LOVED them. Thank you for always featuring such delicious and down to earth recipes!! Made these with the Alice Springs Chicken. TO. DIE. FOR. Thank you!!!! I also made these with the Alice Springs Chicken--both were a hit! Thank you! could you leave the mushrooms whole?